If you love Christmas, you should visit us in the Philippines where the festivities last up to four months. The yuletide season marked by the start of the fall months is a joyous celebration that emanates togetherness. Anywhere with electricity, Christmas songs drift out over the radio and television. Christmas songs can be heard around the clock: riding in public transportation, shopping in markets or passing by homes. To prepare for Christmas, everyone from children to adults form caroling groups. These groups take caroling very seriously; using musical instruments, props, and costumes. They travel throughout local neighborhoods and public areas performing exuberantly. Spontaneous audiences even give tips for the fun and joy the songs bring. Some caroling groups compete for prizes and others raise money for charities. Many carolers sing to bring a smile to the poor or to give away gifts like rice, canned goods and sweets for families to enjoy. Singing is part of the cultural fabric of fun togetherness with friends and family. On the way to school, giant Christmas trees and parols (Filipino star-shaped lantern) with colorful lights bejewel the public spaces. At school, decorating projects are taken on for each classroom. Students design parols, carve Christmas trees from soap, and fashion trees from local materials. If there is no candy to hang on the tree, ornaments crafted by covering stones with candy wrappers are hung! Though Project AK-47 works in Muslim areas in Mindanao, much of the Philippines is Catholic and Protestant. Christmas then, for Filipinos is a time of remembering the kindness and love of God toward all people and making this an authentic experience for all. Filipino families exchange gifts with one another and whenever possible extend gifts to the poor, widows, and orphans. It is our Filipino way of thanking the Creator for the gift of life and all other blessings we are enjoying. In some parts of the country a whole town or village spearheads street wide giving parties! 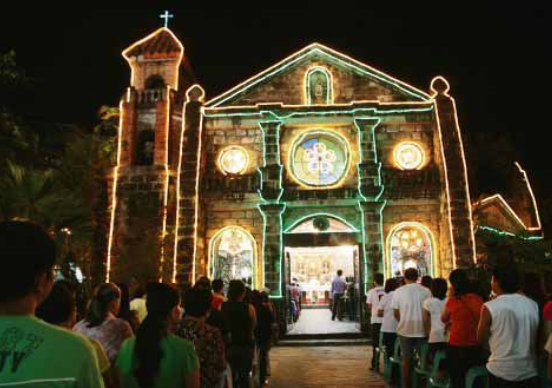 The Catholics observe Simbang Gabi or Misa de Gallo from December 16th through Christmas Eve. Participating in the daily mass shows your faith that your Christmas wish might come true. Filipinos celebrate Noche Buena with food and gifts on Christmas Eve. Family is important to us and we all gather together at our grandparent's house. Noche Buena is an all-night celebration! Parents and children alike play games and chit-chat with their family. Food is part of every celebration for us. Traditional food items include Puto Bumbong and Bibingka, a nectarous rice cake, along with Lechon, a whole slow roasted pig. Tropical fruits grace the table with other native dishes like Valenciana, a sticky rice infused with meat and spices. As well as, Suman made of sticky rice and coco milk. Christmas for us is when every family across the nation can share love, kindness, and care for others. This is a time where communities rejoice in peace. So we keep the celebration long, warm and happy. And fill the days with laughter and food! We wanted to share a flavor of Christmas from some of our children’s projects with you this Christmas season. Even our Muslim friends are able to enjoy Filipino Christmas, so we hope you will have a wonderful holiday too. Thank you for all that you do to help us serve and empower children in conflict regions! A very Merry Christmas from the Philippines to you!